I am not much of a people photographer but I tought that I'd show a few of the photos of people that I made. 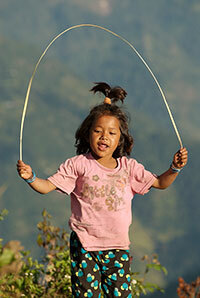 A little girl skipping with a rope. 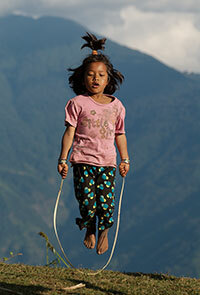 Actually it wasn't a rope, just a piece of finely split bamboo but she was doing really well and enjoying herself a lot. 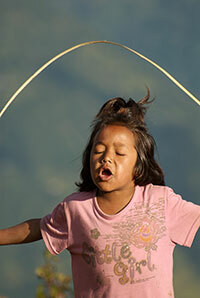 Photo made in Nepal not far from Sukethar in the Kangchenjunga region. 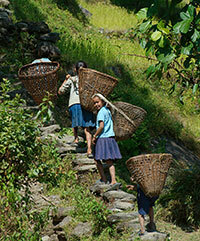 These children were still in their school uniform and off with baskets to collect something. 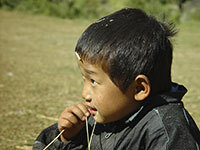 In Nepal children help with farm work from a very early age. Children will also look after their younger siblings like this girl carrying her baby brother. A porter smoking tobacco in a clay pipe. This was photographed whilst crossing the Mirgin La on the way to Ghunsa in the Kangchenjunga region. It was quite high up (above 4000 m) which is why he was wearing cold weather gear provided by the trekking agency. 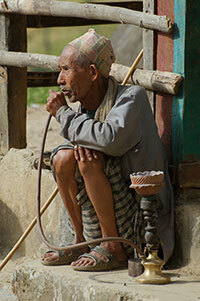 An old man smoking his water pipe on the steps of his house.